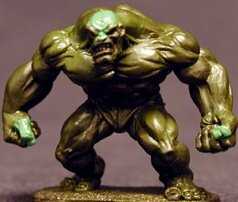 Colonel Marbles Miniatures Masterworks February 2003 !! 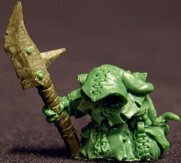 Remember to visit our FrothForum to discuss any of these minis! The hooded figure looks cool enough too (don't know what it's supposed to be but it's the only other one that looks vaguely human). For those 2 models alone, I'll have some of that pie of yours. As for the rest, they're just average for Rackham standards. Which is pretty damned good compared to a lot of the stuff that's out there, but just not quite what dreams (or nightmares) are made of. He's right of course... what a shame about Dragonrune too, though maybe someone else will get more mileage out of their (v. talented) sculptors now. Hehe. Shame on us for seeming so jaded re: Rackham figs, they've been turning out such high quality figs for a long time, but there is a strange dichotomy between the individualism of these figures (as if they were for collectors or skirmish play) and the similarities (as if they were for building units in an army)... I guess I'm only critical cos we'd like to see them cover so many bases rather than sticking so closely to goblin pirates, fianna and wolfen. 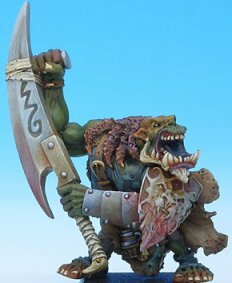 And cos I don't like the goblin pirates, though the chaos dwarfs are growing on me. Wotcha mean? 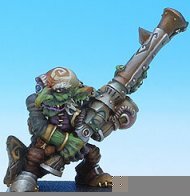 The Goblin pirates are ace. What, like Ace from series 24-26 of Dr Who? You know very well what I mean. 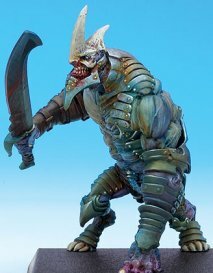 Here's a new limited edition I-Kore Celtos figure. How d'you go about getting you sticky paws on that then ? They are only available in the next few months from I-Kore supporting stores, not on the web etc. 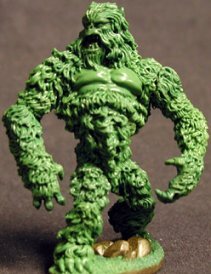 A few new 100 Kingdoms greens, including an excellent big gorilla on palanquin that might fit in well with my 'Nubian' fantasy army concept. Not that you wanted to know that. Oo-oo, I wanna be like you-oo-oo. Nice. Is that an eyepatch? 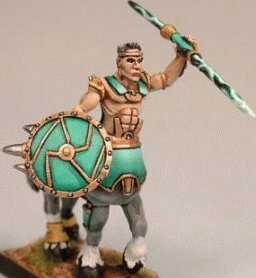 Another good centaur, that ones even better for a greek-fantasy army (which no one has, but the idea has been mooted a few times). 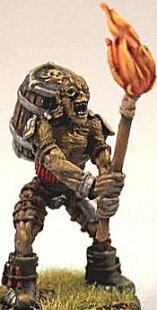 The undead firestarter guy is well good! Really like it, what a great concept... more of these I hope! Looks more like an Orang-Utang to me. Hm, pretty nice they, I like the chaos spawn thingy, nice mix of animal and plant structures. Looks pretty scary in the green, though it'd be a bit daunting to paint it. That looks like a pretty big yeti, reckon it could be a Hero in an army of Copplestone yeti's? Better get to work on the army list there. Really like the 2 headed thang, reckon I could slot that in some where. Wow, they're really getting with it now. The regiment's more than passable, love the mix of heads. But the leader character is superb. Loads of character, though I think what makes him for me is the fact that his sword looks way more in keeping with the setting than the rather westernised swords seen on most of their other figures (I've made that point before). Small details, but they turn a good fig into a great fig for me. Wow, unit packs too, well cool! They are really on a roll and these figures are great! 30 U$D for the mummy unit, thats what, 18 UKP? More than twenty quidsers with postage, for those 10 figs. Still, thats not so bad, they are fine quality figs. If I was going to be hyper-critical, the legs are all the same, with only two knee-down variations (maybe a bit lazy for the price they're asking?). Thats a minor transgression, they do at least have different codpieces, and I can only spot one true duplicate in that bunch. 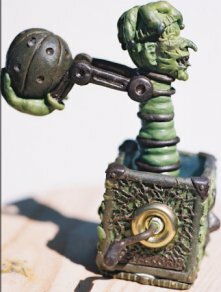 This Jack-In-The-Box from 100 Kingdoms could well be the nuttiest figure I've ever seen. Uh, yea thats pretty nutty, in the continuing tradition of the aptly named 'Freak Show'. Get's an A+ for originality. S'weird alright. 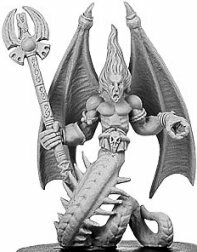 Almost worth getting though just to use the head in a conversion. A couple of forthcoming Rackham dames - they may possibly be limited editions, but my French wasn't up to sussing it out. 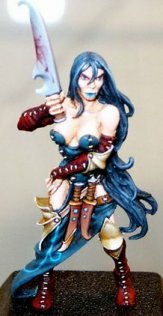 The blue-haired one looks really cool, but I don't like the way they painted her lips. Wow!!! One things for sure, them Frenchies sure know who to do cracking totty. 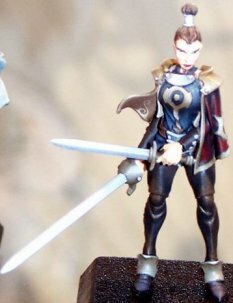 I'm slightly put off by the constricted sword arm position of the second one - always hate the old 'sword up by the head' pose cos it just look so unnatural. But the first one . . . I think I'm in love. What an ace figure. I instantly want to know all about her - where's she from; how she ended up where she did; is she attached. Inspires an RPG character off the bat. Superb, I simply must have her. Bloody hell dude, its only a metal figurine. But what a figure though!!! Dixon's new Vikings appear to be a big jump in standard from their previous level. Wow, having seen their feudal japanese models, this is really a giant leap. Keep up the good work. Makes me think, with all those releases lately, I probably should make time to update that Norse army showcase. They have been steadily improving, but with these they are really ready to play with the big boys! 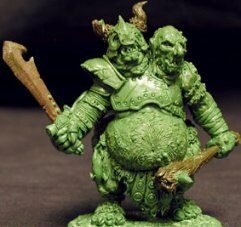 Playing catch up here with a lot of good new mini's coming out - Perry Miniatures have these great new Samurai greens. Damn those Perry twins. They make me want to collect a Samurai army, and I already have more metal than I'm likely to ever paint. Hard to make out from this snap, but hey we know what the quality of these figs is gonna be... right up there. Not sure just how useful this set will be, but for the samurai commander who has everything... why not eh? 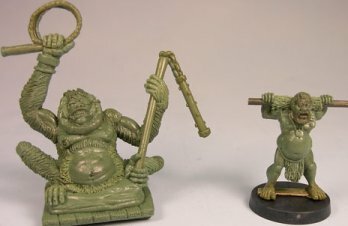 Here's a couple of new-ish Chinatown greens. The top ones nice - love the pose. Not so sure about the bottom one - he combing his hair with that? Yea, not keen on that guy, quite poor IMO. I do like the martial artist lady though. Hmm, naw. I admire the idea of trying something different, but this just isn't working for me. The armour/uniforms are just a little too much a reproduction of ancients for me - ends up looking like you've just stuck some modern weapons on ancient figures and it looks ridiculous. Plus the molding on the trousers are rubbish. 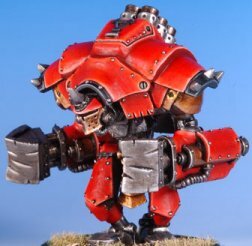 Gripping Beast have these new 'Rus' advertised in Wargames International. 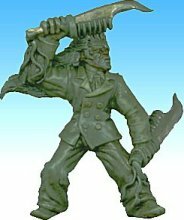 I love the way they do a solid range of more than adequate different figures ideal for a regiment. Ooh, I like those. 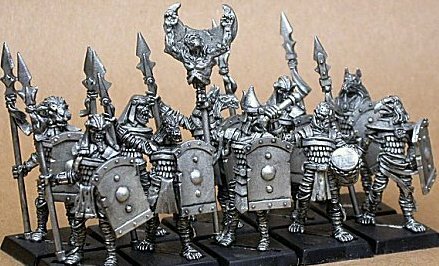 I think a fantasy Norse army would definitely benefit from these... they'd make a good fantasy army, the Rus. Look at em, all Tolkeiny. mmm! More excellent work from GB. How's their website coming on? Those look like they've got a lot more detail than some of their older figs. Or maybe the painter is just 'that' good. 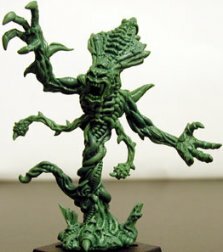 A few horror mini's from a new company called Metal Maniacs. Chucky, Jason and the Scream Fellah - all classics I guess, passably modelled if not exactly wowing me. No Michael in the line up? They all look like characters from certain famous horror movies.. I like the demon, very nice. 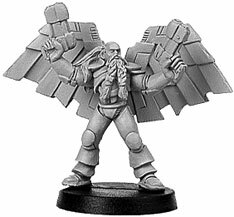 The bearded VOID dude, although I generally don't like this line, works very well... the 'viking' look works well with the wings. Drummer is OK, it'll cost more than it is worth though. The drummer looks good too. Is he an elf? I'm not sure. Not really doing it for me. All a bit too square and clunky, and very standard poses. Not even the demon? I thought that was quite fun. At last some Copplestone figs - the 'Jolly Good Chaps', and some Chinese 'Dare-to-dies'. Thanks to Jason for the heads up. 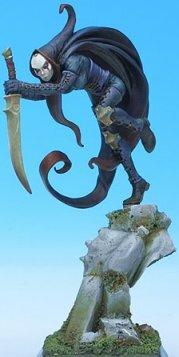 Yet more great Reaper mini's. You can never have too many familiars! Good stuff, I hope they look as good in the final cast. Hm, not really up to the usual standard of sculpting from Reaper. The familiars are quite cool though. That golem's definitely been doing too many steroids. Nice. A few more Rackham weirdo's. 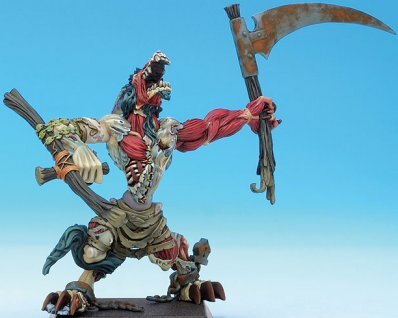 That Zombie Wlofen is cool, good to see some different monsters that can be put in an undead army. 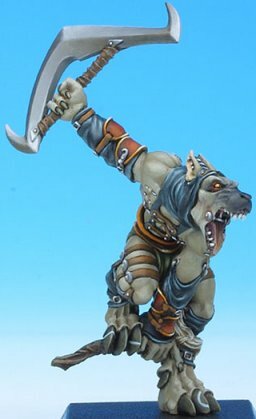 Vindicates my position that what you need for an undead army is conversion stats for converting races to zombies/wraiths/revenants, etc. 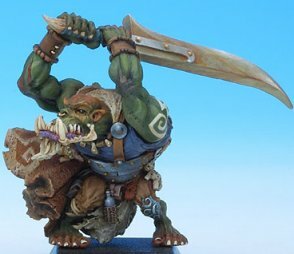 West Wind Announce 'Dwarf Wars' - a new fantasy mini game that looks to be backed up with a massive figure range !!! Excellent. Only the Elves look lame :( as usual. Cool news that. 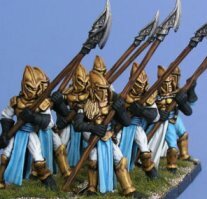 I thought the Elves looked ok in fact- no good for your silvan colonel, but theres a few there (including those spear) that would do nicely in a High Elf army. 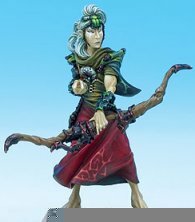 The bowman (on the site) does look pretty static though, like an old-style plastic mini. Ugh! Very nice indeed - I love those green blokes, nice teeth! 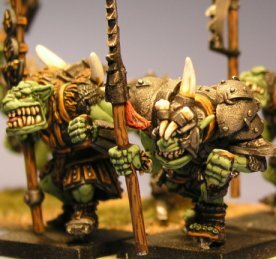 Yea, I hate to say it but the greenskins are great too. 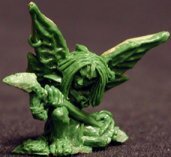 The Colonel's daily subscription service is sadly now ended... but remember you can still visit our FrothForum to catch all the latest dispatches and to discuss any of these minis! Click on the link for each entry to join the discussion! 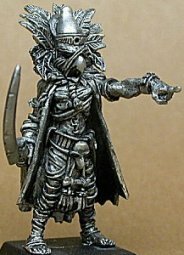 Discuss miniatures on the Colonel Marbles Frothforum !